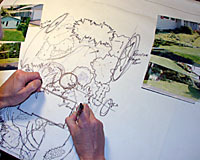 The first step in creating your landscape design is developing a "base plan" of your property, at right. This plan will include all of the information from your survey (e.g., dimensions of your property, utility lines and right-of-ways, location and dimensions of other permanent features such as driveways, fences, etc. 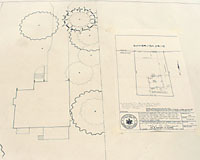 ), your architectural drawings and other observations (e.g., location, size and species of existing trees and shrubs, etc.) I made during our meeting. Once the site details are documented, the creative process will kick into high gear as I'll lay a series of trace paper sheets over the base plan, at left, to sketch out specific site conditions (e.g., steep slopes, wet soils, deep shade, views to be screened, etc. ), functions/uses (e.g., play areas, vegetable gardens, patios, walkways, etc. ), and design alternatives. When I'm satisfied that I've addressed all of the needs and desires you've expressed - in a manner the conditions of your property will allow (e.g., if you express a need for color in a dry, shady corner of your backyard, I might meet that need by specifying masses of spring-flowering bulbs, summer-blooming hostas and liriope, and fall-blooming anemones that tolerate dry shade), I'll transfer information from my sketches onto the base plan, resulting in a "plan-view" landscape design for your property, above. 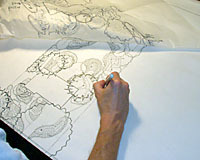 For a closer look at a completed design, click on the "Completed Design" link at right.